If you thought table tennis was hard enough, wait until you see what Mark Wheeler and a team of designers have come up with. Ping Pong FM puts a Guitar Hero-like spin on the classic sport. However, unlike the actual game, Ping Pong FM is more collaborative than competitive. That’s because players must hit the ball back and forth to keep the music going. Select your paddle, choose your song, and serve. Rally too slowly, or miss the ball, and the music will wind down. Rally at the correct tempo and the party is on. As you can imagine, faster tunes like “Intergalactic” by the Beastie Boys or “Milkshake” by Kelis are more challenging. 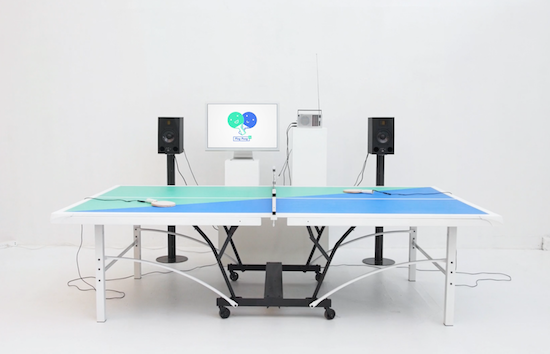 Although it may resemble an ordinary table tennis setup, Ping Pong FM is much more high-tech. Contact microphones are placed inside each of the paddles to track gameplay, while the microphone audio is processed by an Arduino hidden in a retro radio case that listens for peaks above a threshold. When a hit is registered, the Arduino sends a Player ID via USB to a computer running the game app, which displays the song coming out of two speakers and adjusts its speed accordingly. You can see Ping Pong FM in action below and read more about the project here.